Campaign: The planet of Fanascifi is a hodgepodge of futuristic locales, scraggly medieval countryside, blasted wastelands and empty oceans. The ruins in the wastelands beckon with rumors of powerful artifacts and riches beyond an adventurer's wildest dreams, however, the threat of strange monsters and wild inhabitants keep the ordinary person safe in their domed cities. The Prophets of the Wind travel the lands, proclaiming that heroes must rise to save the good folk from death at the hands of the Wastes. Homebase (Hex 0) (0000): Koslanda - This domed city is home to the Great University, last refuge of magic users and scientists who are seeking ways to get off-world or to different planes of existence. The Order of Tarana maintains their chapel here, consisting of gnoll champions of a neutral god seeking out their "primas" - a myth of special humans who can form a bond with a pious gnoll, helping them to reach perfection in their lives. The Mayoress Ashanda is worried about an impending gang war between the Cult of Psi-Veterans and the crime lord Galtan; she fears the effect of a bloody fight on trade and security in the city under-passages. Location 1 (0001): TSS Zekedsel - The metal bones of this great Starship jut up from a huge crater and now serve as a huge marketplace of recovered artifacts and other goods, run by wiley goblins and guarded by dour orcs. The half-buried ship itself is a huge maze of passages and chambers full of strange, twisted creatures and enigmatic guardian robots protecting hidden treasures. A traveling gladiator arena has set up shop nearby, with cityfolk and villagers alike rubbing shoulders together to watch the bloody spectacles between contestants and grotesque circus animals. Location 2 (0101): Karna's Strike - The dried up gold mine has been reopened by a band of beggars who are under a strange compulsion to dig in the deep holes to find "The Stone"; an evil artifact with a growing hunger. The effects of the artifact have already started creating mutants and bandits out of the miners, who have kidnapped "healthy specimens" from farmlands across the mountains and brought them back as slaves. A small team of mercenaries, hired by desperate farmland burgomasters, is surveying the camp and mine to find a way of rescuing the slaves. Location 3 (0201): The Nameless's Temple - This ancient edifice, built for an evil ancient snake god, is now inhabited by a sect of Apologia, priests and paladins striving to ensure that evil is never reawakened. One of the priests secretly worships the Nameless and is subtly perverting the paladins to serve the god's purposes. Visitors to the Temple are encouraged to swim in the flooded canals beneath the temple, rumored to have healing effects for those who can reach the deepest passages. 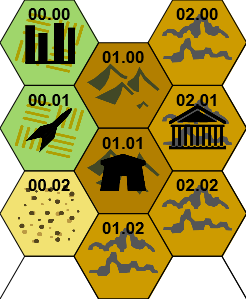 This Three Hexes campaign starter marks the 52nd entry in the series. A year's worth of weekly campaigns. Thats awesome! Thank YOU for supporting me, encouraging me, and most importantly, using these in your games! If you look and listen hard enough, you'll hear the soundtrack from the 1981 Heavy Metal movie, as well as see some of the influences and riffs in this campaign starter. There are FOUR dungeon possibilities in here, one in each of the destinations as well as homebase! As for my favorite song from the Heavy Metal soundtrack? Radar Rider by Riggs! Hi Ayube, thanks and thanks. Yes, I am (both movie and genre). I do! If you scroll up to the top of my blog, over to the left, there's a link that will take you to all the posts that are tagged with Three Hexes. Let me know if you use any, please! I love hearing how other folks use the campaign starters.